Prentice Cooper WMA Trails v2.0, located approximatetly 8 miles West of Chattangooga, TN. 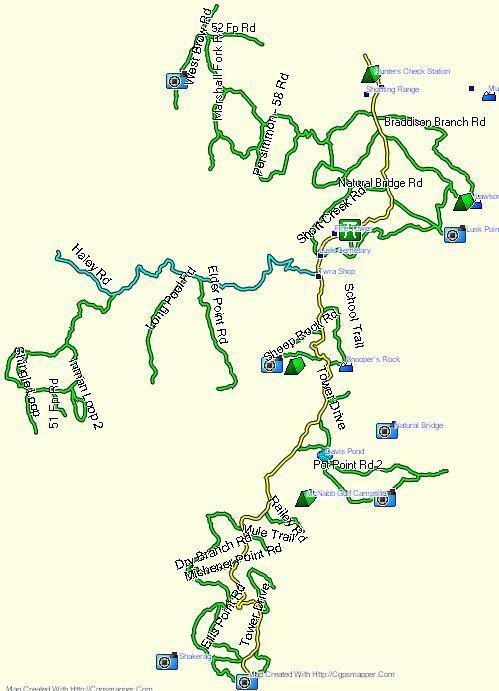 Map has 75 miles of OHV / ATV trails and includes 95 POIs for Parking/Staging Areas, Foodplots, Scenic Overlooks, Pond, Official Buildings, and other points of interest. Trails are closed to all OHV / ATV traffic during Prentice Cooper WMA designated hunting times. Check locally for open trails before going there to ride. 8-19-12 - v2.0 improved accuracy of Sheep Rock Rd. and Hemlock Branch Rd. and added 1 new trail between Maple Branch and Short Creek Rds. Trails are color coded per trail difficulty, as follows: (see readme.txt file, also). Before installing Prentice Cooper WMA Trails v2.0, manually uninstall my previous version if you had downloaded and installed it from GPSFileDepot.com.